Gahaya Extra Large Moon Lamp Review BackyardToolshed - All your tool needs in one place! Moon lamps come in different sizes and have different features. It’s honestly the matter of preference in order to decide which moon lamp is best for you. Sure, the tiny ones are adorable and works fine in terms of light power. The average sized ones may compensate its size for brilliant features. All that’s great, but we’re talking about the moon here. Wouldn’t it be even more amazing if it was big? Gahaya came out with its extra large 3D printed moon lamp that’s extra pretty, too! Measuring 7.3 inches, this moon lamp is as wonderful as the real moon in the sky. With perfection in mind, the Gahaya 3D moon lamp was made with the most advanced 3D printing technology. And being innovative doesn’t mean using harmful materials as well, because this particular lamp was made from Polylactic Acid (PLA) materials extracted from corn stalks. High quality can now be non-toxic and environmentally friendly. For an overview of the most popular Moon Lamps, be sure to check our full Moon Lamp Review! One of the amazing features this moon lamp has is that it’s designed to adopt a low voltage. It’s also equipped with an energy efficient LED light bulb. Now this is a moon lamp that’s safe and reliable. The Gahaya 3D moon lamp is also made to achieve the perfect night light glow. It has two different color settings you can choose from which is cool white and warm white. The cool white setting would create a full moon ambience while the warm white color setting is best for drifting to sleep. It’s also optimized to prevent any flickering, so you can enjoy a continuous, beautiful beam. When you buy the Gahaya moon lamp, you will also get in your package a 1 meter USB cable for charging. However, you will need to use an adapter if you choose to plug it in your power outlet directly. Another option would be to use a USB charging hub or just plug it to your computer’s USB port. This moon lamp needs about 3 hours to charge fully. Once it’s fully charged, it can work for as long as 20 hours. The Gahaya moon lamp can’t be used while charging, though, so you have to keep in mind its charging hours. 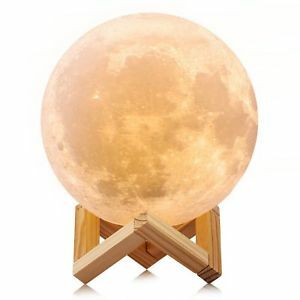 Along with the cable, you will also get a very nice wooden mount for displaying your moon lamp. A great trick to show off when you have company is to make your moon lamp spin while it’s mounted on the frame. Make sure that there’s no wind or air that can disrupt your moon lamp’s spinning. Last but not the least, your package will also include an instruction manual for your perusal. If ever there are any problems to the items in your package, Gahaya offers a Free Return policy, so you don’t have to worry. A wonderful display, a magical night light and a perfect replica of the moon, that’s what the Gahaya 3D moon lamp is. The work put into creating this enchanting piece is very detailed and impressive. Once you have this moon lamp, you can definitely say that you now have your own moon in your room.